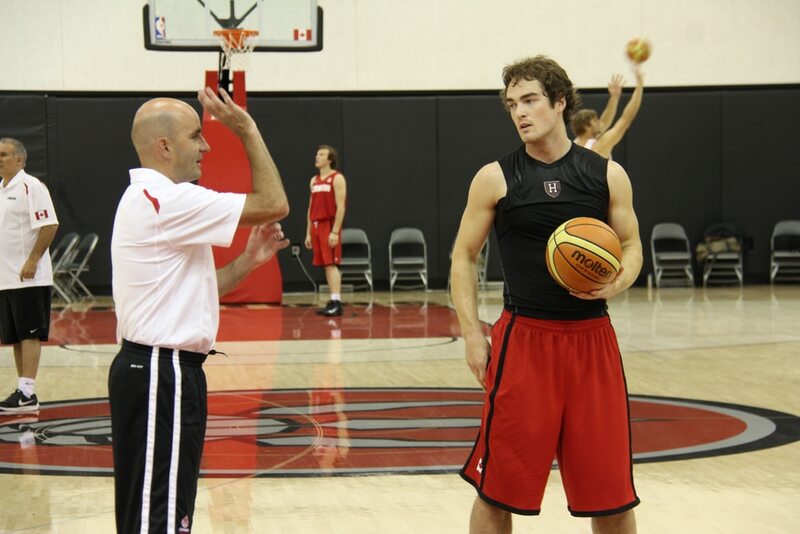 This article was written by NBA shooting coach Dave Love. Let me start by saying that I do believe in changing mechanics. I feel like it is easy to fall into the idea that “old dogs can’t learn new tricks” or “if it ain’t broke, don’t fix it.” As I watch shooters, there is usually a physical reason for why they miss the shots they do, and I believe that if you can fix the physical flaw, the results will improve. In fact, I have a social media presence and a whole newsletter (you can sign up for it here) dedicated to helping players identify potential flaws and the physical changes they can make to improve. With that being said, I also believe there are circumstances where or when a player should not make major changes to their shot. If you are not able to be consistently held accountable. Let us talk about that last one for a second. I get players all the time that come into my life, and I believe they need to make significant fundamental changes. Maybe they sign a ten-day contract, or maybe they are at a predraft workout. They are weak shooters, and I can see the reason why, but the problem is I am not going to have the time to help them build the new habit. So I have to bite my tongue and hope they find someone in their life that will give the consistent time needed, or that we end up in the same place long enough to do it ourselves. What I do not want to do is start a two-month process with someone I can only support for one day. But let us focus on little things that any player can do that will help them improve some, without making significant fundamental changes that may be needed. This is so simple, yet I rarely see anyone do it. Do you have a practice? Individual workout? Game? Tryout? Get in the gym 10 minutes before it starts, and warm up your shot. Get 25 form shots from close to the hoop. Have good balance, get to the bottom of the ball, get your non-shooting hand off the ball, follow through well. Then get five catch and shoot shots from 5 spots on the floor, staying close to the hoop, then back out a couple of steps and get 25 more. Then practice a little faster and more game situations with cuts, pivots, and jabs. If you have time, think of 2 situations that you know you will get shots from and practice those. Shoot some free throws. If you do not have time for all this, no problem, just cut everything in half or less. But do not bury your head in the sand and come into situations unprepared. Even practice. You may think you do not need to warm up for practice, but your coach will be forming opinions of you, and if you are missing shots early in practice because you are not loose or feeling right, their opinion will be that you are not a good shooter. It is a natural impulse for players, especially young players, to want to make shots more complicated than they need to be. It is an ego thing, where we think it looks cooler to be able to make a more challenging shot. In reality, our habits need to be to keep our shot as simple as we can, not to intentionally make our own shots more difficult and harder to make. The best way to keep your shot as simple as possible is just to try to land on two feet at the end of your shot. Do not kick your right foot out in front of you, rotate your shoulder and lean back. Keep it simple. Sure, finishing on one foot might look cooler, but what looks best is swish after swish, after swish. This is such a subtle thing, but once you notice it, you will see it is everywhere. Players shoot a shot and immediately step back, usually to prepare for their next shot. Maybe they are on a shooting machine and immediately need to step back to hop into the next shot. Or the drill calls for them to shoot, then go to the back of the line behind them. Players do this so often that it becomes a habit and in time they start shooting mini-fadeaways in situations that they do not need to shoot mini-fades. Instead, try to finish your shot on two feet, hold your balance, then step forward. We want the ball going forward, towards the rim, so if you are going to lose your balance, we want to lose it going in that direction. This is everyone's least favorite idea because it involves separating what you can do consistently from the more glamorous things you can do once in a while. It involves putting the good of the team above the individual. It involves admitting our weaknesses and playing to our strengths. Want to make more shots? Stop shooting the shots that you "can make, I swear, I can make it!" And only take the shots that you do make, regularly, and consistently. If you are a weaker shooter who can make open mid-range, but your percentage drops significantly on contested 3s, then only shoot the open mid-range, and when you get the contested 3, try to create something for a teammate. Everyone thinks that this means you are giving up shots, but the reality is, you are just giving up your misses. If you avoided the shots you do not make often, penetrated the ball and got an open look for a teammate, then the next time that teammate was faced with a shot they do not make regularly they would be more willing to penetrate the ball and create something open for you. The same number of shots for each of you, but both are open. It just takes discipline, trust, and a good team culture. I will not even get into what I think the right target is or why. Just find something. Too many players are only vaguely looking at the rim as they are halfway through their shot. If you want to be great, just try to lock in on that target as early as possible, and with as much precision as possible. Instead of seeing the rim as you are into your shooting motion, try to locate the rim immediately after the catch or dribble pick up. "Yeah, but coach, I know where the rim is" people will say, and while that is true, it is not the issue. It is not about knowing where the rim is; it is about using your eyes and brain to make the necessary calculations they need to. The brain is pretty amazing and can figure out the situation quickly, but if you can do something simple to give it 50% more time to make the calculation, isn’t that only going to help? When young players go out to shoot, many times they shoot a shot, grab the rebound, take a couple of dribbles and shoot again. There is little to no thought put into game situations. If you play at a reasonable level, you should have an idea of the plays that are going to get you shots. They might be different for everybody, but you should start to see situations that your shots come from. Maybe you come off a wide pin-down screen and curl for a jumper... great, practice that. Or, perhaps you get most of your shots from catch and shoot situations with the ball swinging around the perimeter… great, work on those. Avoid standing with the ball in your hands and just shooting. Slide a step or two on the catch because in games we rarely get perfect passes. All it takes is investing 15 minutes, and a little thought into what shots your coach tries to get for you, then practice making those shots. There are a million ways to improve your jump shot. Some of them are physical changes, some mental, some emotional. Most involve some discipline and accountability. The majority involve remembering to use a new skill. As a player, it is on you to apply some of the lessons you learned here. As a coach, it is your job to hold the player accountable continuously. Nothing will come easy, so don't even expect it. Take a couple or all these ideas, invest slightly more attention to them than you have in the past and I'm confident you'll see improvement. Just a quick note on your suggestions on improving your shooting. We concur with your offerings completely. These are things that we stress with our seasoned and new students alike. Our first rule regarding shooting is, all things taught must be logical, then have reasons why this works and other things do not work. Again a great piece of advice for players and coaches particularly the land on 2 feet and step forward. If that becomes automatic then put back rebounds from any distance are more guaranteed as players are in balance and going toward the basket.